One of the most well known brands in the marine & vehicle industry, Dometic Group is the worlds leading supplier of dedicated systems and equipment for boats & vehicles. Fischer Panda UK's partnership with Dometic forms a strong and reputable offering to our marine and vehicle clients. 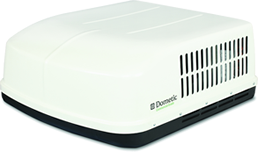 Matching the worlds leading generator with Dometics premier Air-Conditioning range we are able to offer integrated system solutions for any application. We can also supply Waeco and Sealand products where required. Fischer Panda can provide either simple, spot cooling for problem areas or accurately control the whole on-board environment. We can design a system to suit your application whether on a vehicle or boat. 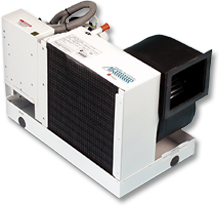 Self-contained air conditioners are ideal for vessels up to approx.15 meters (50 ft) and can be concealed under a bunk or seat, in a locker or cupboard. 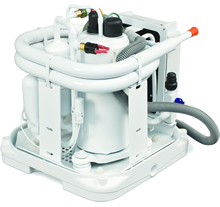 These systems are by far the most common and cost effective solution for all types of boat. Ideal for vessels up to 24 meters (80 ft.) split-gas systems consist of a condensing unit and one or more remote evaporating units. Can achieve a quieter installation and uses less space in the 'living' accommodation. 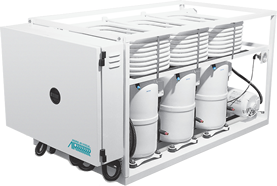 Intended for larger vessels, chilled water systems use a closed fresh-water loop between the chiller and multiple air handlers in the living spaces. A more costly system which delivers more flexibility in terms of cooling and electrical load management. Rooftop mounted units or under bench systems for specialist Vehicles, self contained air to air cooling. All systems are available as mains AC powered or DC powered.